Hi there! In the very short time I've been diagnosed autistic, I've come across some very confusing or downright asinine ways people address me and some other autistics while in conversations, both online and in person. I thought I would be nice and put together a cheat sheet for people to refer to when they are in contact with an autistic. 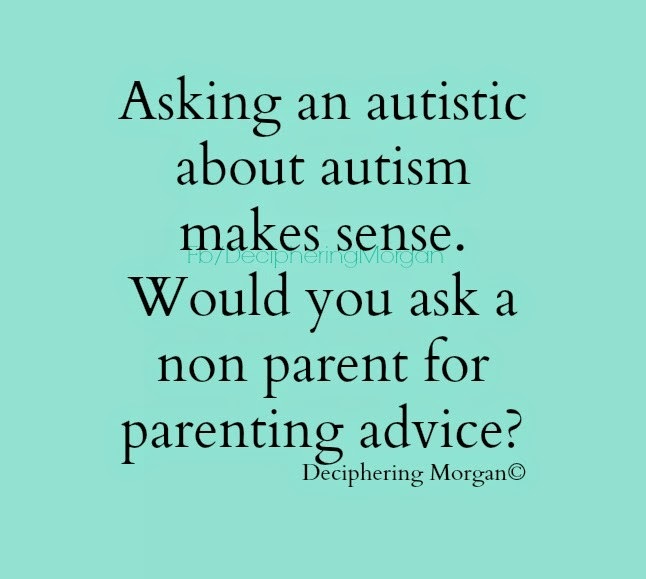 Now, mind you, this is based upon my experiences as both an autist and a mother of an autistic, and in no way does it reflect the attitude of the autistic community as a whole. Step 1. Say, "Hello, my name is ----." Wait for a response. Step 2. Talk to us like you would a person. Because we're people. Who knew?! Step 3. Never say, "But you can't be autistic! You're so pretty/married/verbal/smart/independent." This is a tip off to the autistic that you may just be someone to kick. Not that we kick, but we might want to kick. By we, I mean "me." Step 4. No small talk. Get to the crux of what you're discussing or wanting to discuss. If it's the weather, it'd better be pouring. Step 5. Want to discuss autism? Great! Now, this is a biggie. If you are in a discussion about autism, person first language, or functioning labels, put on your listening ears. You're actually talking about autism with an autistic. There is this thing called being polite, which involves digesting what the other person is saying. Don't assume to know better. Don't tell me what to call myself. Don't assume to know my functioning level or that of my child. To do so is to make yourself look like a jerk. My least favorite thing to hear is, "Don't let autism define you! It's only part of you!" Yes well, that might be so... but my skin color, natural hair color, and being a female are only part of me, too, and I can't get rid of any of those things. All of those things in some way define me. Last thing on this: if you ask an autistic for what autism feels like, allow them to answer. Don't then negate that. It makes sense to ask an autistic what autism feels like. Would you ask a non parent for parenting advice? Step 6. If we're in person, don't hug/squeeze/or otherwise touch us unless you know it's okay. Some of us really don't like to be touched. Step 7. "Well, if you're autistic, what's your autism talent?" Just... no. Ask what we're interested in. Something like 2% of autistics are savants. I'm not one of them unless you count my amazing ability to swear. Step 8. If you say, "Let's do this again" please mean it. I'm going to take you very literally. If you've read through this and you're wondering what can you say to an autistic, or me, well... I think it's safe to say a good majority of us appreciate debate. I know I do. However, we hate having our neurology used against us. People do that quite a bit and it feels like a knife in my stomach- I can't speak for others. - and plenty of other things. Well written, and thank you. Well written as always. Read this out-loud to a friend that only has NT's and she giggled and nodded, because she's familiar with my two with autism and my youngest that is picking up her social cues from her brother and sister. Thanks for sharing! I'm an autism mom and this is wonderful. Hearing from Autistic adults helps me understand my son better. Although he inherited his mouth from me, so at 9, he's really starting to give me some perspective. Whatever suits you, Helen. I know this can be hard to remember. Bless your heart. My grandson is 4 1/2 and non verbal. He reads flash cards but doesn't speak. As an autistic adult, did you experience that? I hold hope that he will break his silence. No, sorry. I was a very early talker. I remember mimicking the adults around me in speech and wanting their attention, so I talked a LOT. However, I do have issues with speech when I am nervous, upset, or angry. My son, however, was non/semi verbal with some echolalia up until the age of five. He didn't even have more than a few words of echolalia in his repertoire until he was five. He's now nine and though he stumbles with words (pronoun confusion/reversal), I have a hard time getting him to be quiet. awesome. Im not autistic but my son is and I have more trouble trying to communicate than he does. thus I haven't figured out how to tell my 9 hes autistic. ok not tue. that Ive told him but the what is its, hows, whys, and what does it means?Im stuck.